Home English Pawan Kalyan will address him as ‘sir’ forever! Pawan Kalyan will address him as ‘sir’ forever! ‘Aatagadhara Siva’ is an upcoming film. You must be wondering what it has to do with Pawan Kalyan. Here’s an interesting link to Power star with Aatagadhara Siva. The film’s hero Uday Shankar’s father was once a teacher of Pawan Kalyan. Jana Sena chief himself has revealed this. 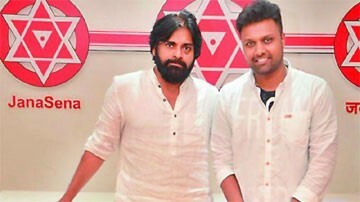 Pawan released a song from the movie. On this occasion, he said that Uday’s father Sreeram had taught him English and that he addresses him as ‘Sir’ forever. Pawan added that Sreeram has influenced him into getting attracted towards spirituality. He wished and congratulated Uday Shankar for his debut.